Throughout U.S. history, the lives and struggles of Native Americans have been disregarded and disdained by the white, middle-class, christian, capitalist, Nature-despising national Establishment. Sadly, the disregarders and disdainers also included the great majority of socialists, communists, anarchists, trade-unionists and others who considered themselves critics and opponents of that Establishment. The IWW was the great exception. From the start, the One Big Union welcomed Native Americans, as they welcomed all people of color, and denounced their exploitation and persecution by Capital and the State. Here as elsewhere the Wobblies were inspired by their Abolitionist forebears (Wendell Phillips and Lydia Maria Child advocated especially radical views on what was then called the “Indian Question”) as well as the “Chicago Idea” anarchism of the 1880s (August Spies had lived with the Chippewas in Canada, and Albert Parsons and his wife Lucy, herself of Native American descent, were forceful agitators against U.S. government “anti-Indian” policies). The early IWW press refers often to Native Americans, always in a spirit of revolutionary solidarity. Big Bill Haywood and Ralph Chaplin were prominent Wobs who proclaimed their admiration for the myths and lore and ways of life of those pioneer anarcho-communists, the indigenous Americans. 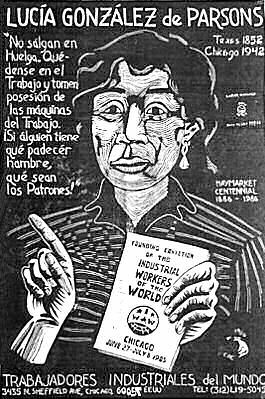 Historians regularly overlook them, but Native Americans made IWW history: Lucy Parsons, Frank Little, William Stanley, Frank Ellis and Lone Wolf are just a few. Along with Joe Hill, Sam Murray and others, Native American Wobs were active in the Mexican Revolution, fighting alongside the Magonistas for “Land and Liberty.” Later, large numbers of Native American farmers rallied to such IWW-influenced organizations as the Working Class Union, the Oklahoma Renters’ League and the Southern Tenant Farmers’ Union. Jack Sheridan, Fred Thompson, Carl Keller and other old-timers I met at the Chicago IWW hall in the 1960s more than once pointed out to me that whatever we enjoyed of democracy in this country we owed to the Iroquois rather than to Europeans. 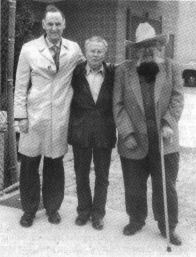 From left: Paul Avrich, historian of 20th century anarchism, Federico Arcos, veteran of the anarchist militias in the Spanish Revolution, and Carlos Cortez, May 3, 1998, in Chicago at the site of the original 1886 Haymarket rally that ended with a bomb being thrown at police. Fellow Worker Cortez was certainly the right man for the job. With Utah Phillips, he was far and away the most influential Wobbly of the past quarter century. Immediately the youngster embraced his Mexican/Native American heritage, which he cherished the rest of his life. Interestingly, joining the IWW strengthened his “Indianness,” just as his self-awareness as Indian deepened his commitment to the Wobbly vision of worldwide working-class self-emancipation. For Carlos Cortez, these two aspects of his identity were fundamentally one, and nourished each other. He took his main pen-name, C.C. Redcloud, from the famed Oglala Sioux resister of white settler invasion. His other pseudonyms, Nuberoja and Punapilva, were Spanish and Finnish translations of Redcloud. 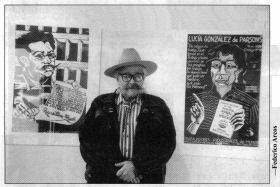 In the 1970s, with the rise of the American Indian Movement, Akwesasne Notes and other Native American periodicals, and films such as “Little Big Man,” a younger generation of radicals found Carlos Cortez an able and appealing mentor. As a soapbox poet, he had the knack of making strong points with high humor. Native Americans, he liked to explain, were “practicing ecology and the classless society for thousands of years before our ‘civilizers’ even had words for these things!” His last poster was a powerful linocut portrait of one of his heroes: Native American Wobbly organizer Frank Little.